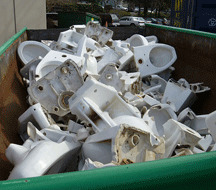 Recycling Update: Due to market conditions, we are no longer able to accept porcelain products for recycling (toilets, sinks, tile, etc.). We'll keep you posted if market conditions change and we can accept these items again. Thank you for your understanding.